WATERVILLE — Bolley’s Famous Franks made a change in late June that has left some customers feeling heated. What has them so worked up? 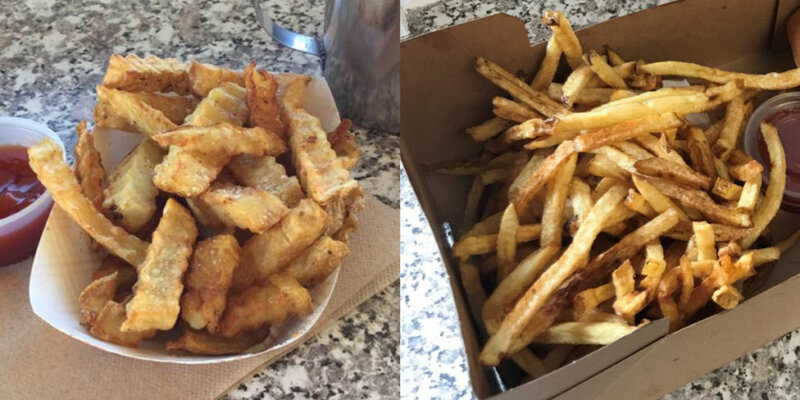 The College Avenue icon’s decision to switch from crinkle-cut to straight-cut french fries. Recently, though, the outrage regarding the change made by owners Leslie and Jim Parsons has escalated. Jim Parsons said a man came in earlier this month, angry about the change, and ended up threatening to fight him when he was kicked out for becoming disorderly around customers. The Parsons family is not affiliated with the original group of brothers who opened the hot dog shops. It was run by three generations of the Genest family, starting with Guy Genest in 1962, until closing in 2014. The Parsons family reopened the Waterville Bolley’s in 2017. Donald Pooler, owner of the Bolley’s Famous Franks in Hallowell, said the franchise started in the 1962 when the eatery opened on Bangor Street in Augusta. It moved to Water Street in Hallowell in 1972. While crinkle-cut was the standard in Waterville, Pooler said the Hallowell location has always served straight-cut fries. The change, Leslie Parson said, comes down to finances. In the prep kitchen, a heavy metal machine affixed with crinkle-cutting blades sits idle next to a straight-bladed spud cutter. The crinkle-cut fries are cut vertically and horizontally with two sets of special blades that are sold in boxes of 10, and are usually purchased monthly. Leslie Parsons said the blades are flimsy and half of the money the restaurant takes in from french fries goes back into repairing or buying blades. The new fries, about as thin as McDonald’s fries, are exactly the same product aside from the aesthetics. The potatoes are from Fryeburg’s Green Thumb Farms, which Jim Parsons said is the best potato in Maine. The restaurant sells more than 1,000 pounds of fries a week, he said. Leslie Parsons wrote a Facebook post last week after the threats and grumblings of customers became, what she perceived, a threat to her family’s safety. She said the safety of her three daughters — who regularly work the cash register or hang out around the store — was called into question with angry customers. The post received more than 200 comments pledging their support for the business and condemning the behavior of angry customers. Brian Bane, a Pittsfield resident who works at the Waterville Post Office, said Tuesday that the fries were still as good as they ever were. Some commenters on the Facebook post were blunt with their opinion on the change. Doe said that he did not know if he would stop eating at Bolley’s because of the change — he’s swayed by the hot dogs topped with fried salt pork — but he said customers acting out in the store were in the wrong. “If you want to show your displeasure, state it to the owners in a considerate way and take your money and respectfully take your business elsewhere,” he said.